By Patrick Verel on November 9, 2018 for University News. 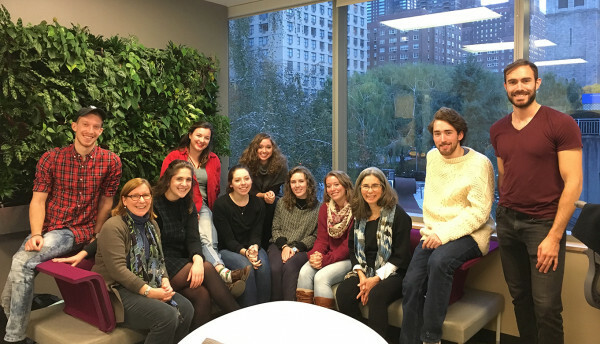 When Fordham’s Social Innovation Collaboratory launched in 2014, the goal was to create a hub for the many social impact and sustainability efforts happening throughout the University. With a recent $1 million gift, Brent Martini, GABELLI ’86, has ensured that those efforts will grow exponentially. “This will be, and can be, core to who Fordham is, in my humble opinion,” said Martini, a former president of the pharmaceutical firm AmerisourceBergen and current owner of vintage car dealer Martini Vintage LLC. Carey Weiss, director of the collaboratory, a university-wide initiative managed by the Gabelli School of Business, said Martini’s gift is the largest it has received to date, and is a bona fide game changer. 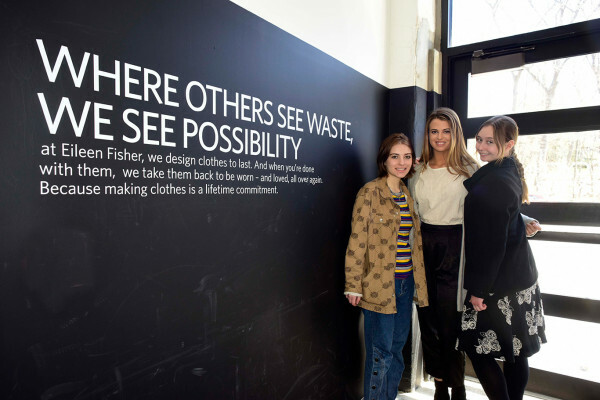 Members of the collaboratoy’s Sustainable Fashion Team visited Eileen Fisher Company’s Renew Project. Weiss said the collaboratory was conceived by Fordham’s late provost Stephen Freedman in 2014 as part of the process for designation as an Ashoka U Changemaker Campus. In receiving that designation, Fordham joined a network of 25 other universities and colleges around the nation that are helping change the world through social innovation. At the time, Ashoka’s review team expressed concern that Fordham had social impact projects happening everywhere, but lacked connectivity between initiatives. Weiss said the collaboratory takes all of that faculty and student thought leadership and turns it into practice, with measurable impact and outcomes for society. The collaboratory’s programming, which was at the outset offered only to Gabelli School students, has in the last three years expanded to include students at Fordham College at Lincoln Center and Fordham College at Rose Hill students as well. And since 2015, faculty from five of the University’s colleges have participated. Now, thanks to Martini’s generosity, the collaboratory is poised to expand to make an even greater impact. 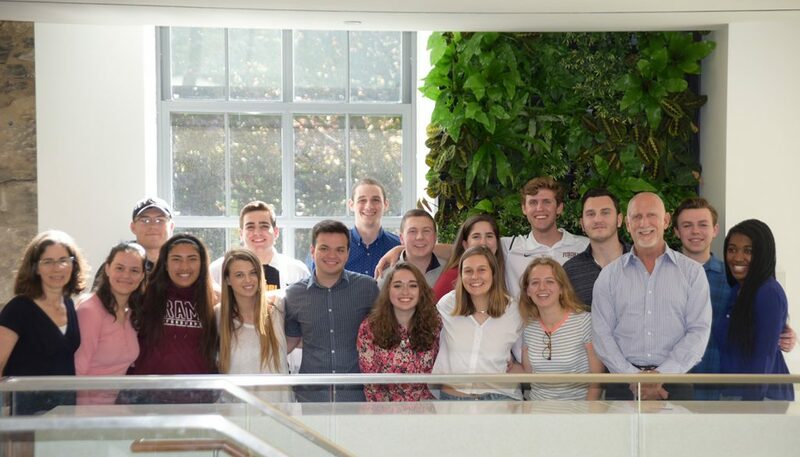 As part of the course Sustainable Business Foundations, students from the Gabelli School of Business and Fordham College at Rose Hill worked in teams to identify potential challenges for BMW’s new fleet of electric vehicles. Martini previously funded the chair in global sustainability occupied by Gabelli School of Business professor James M. Stoner, Ph.D., and has served as executive in residence at the Gabelli School since 2015. He became interested in environmentally sustainable and inclusive business practices in 2011, when he decided to reenter the job market with COVE Financial Group, a lease-to-buy real estate business that he ran for four years. He credited Stoner, with whom he’d stayed in touch over the years, with bending his ear to talk about sustainability and social innovation. “That’s kind of the way Jim’s always been with me. Give me something to think about, and then wait for me to think about it. This time around, he also had a hook, which was, ‘You have a young daughter, right? So while you’re building a new business, it would be appropriate to really think about the world that you’re creating, the business you’re creating, and the environment you’re impacting,’” he said. 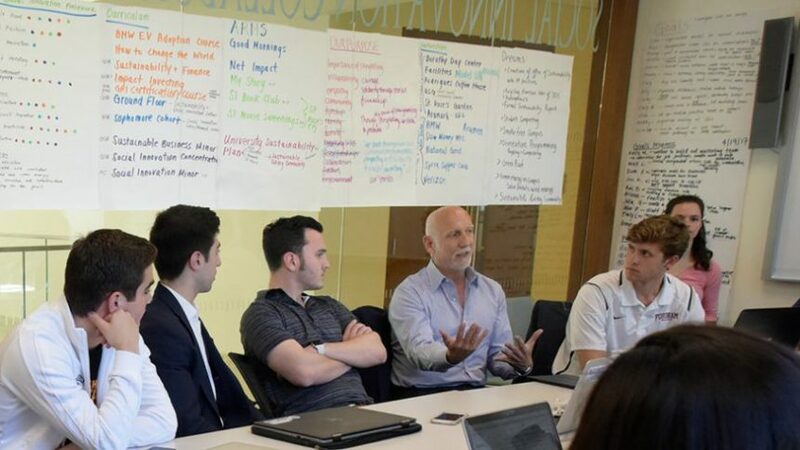 An example of an initiative the collaboratory has spearheaded is Sustainable Business Foundations, a course at the Gabelli School where students could, for their midterm, work in teams to identify a real-life problem for either BMW’s new fleet of electric vehicles or the city of New Rochelle, and design a sustainable solution. 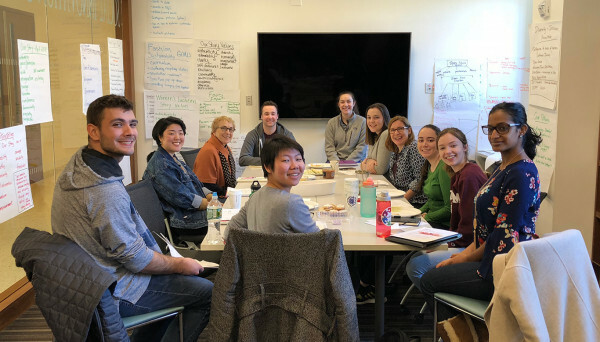 Social innovation has also been embedded in the Ground Floor, an introductory course that every first-year undergraduate student at the Gabelli School takes. And a new course, Impact Investing, was recently unveiled for junior and senior finance majors. The collboratoy’s Our Story team prepares for a town hall event. Weiss said Martini’s gift will allow the collaboratory to build out its infrastructure so it can serve other colleges and centers in the University. That includes more physical space that can accommodate students who want to plan events such as its Our Story gatherings, the second of which will be held Nov. 12. It will also increase opportunities for research and new coursework. “With a better understanding of our own university, who the players are, and what the needs are, we can build this out to serve a much broader section of community,” she said. The collaboratory’s food working group in the Lincoln Center space. Weiss said part of the beauty of focusing on social innovation is that it provides a common theme on which seemingly disparate disciplines around the University can find common ground, allowing faculty and students to break out of the “silos” that are common in many large organizations. One initiative that the University will be launching soon is a GiveCampus Campaign, which will be spearheaded by the Fordham Fund, and will be dedicated to raising awareness and funds across all units of the university, including the collaboratory, for social innovation activities. Martini said he’s excited to not only be a part of building out the collaboratory, but also to have a front row seat to the action. Although he lives in Laguna Beach, California, he visits New York City every five to six weeks, and says spending time with the students is the richest experience he has these days. Helping to provide them with innovative spaces to work in is his way of thanking them. “I believe spaces are critically important, not just as symbols, but as places where people come together and do work. At any given student leader meeting today, you would see 25 kids jammed into a room,” he said. “I’m driven to make Fordham as great as it can be,” said Martini, who has taken to his role as executive in residence with great zeal. Top Photo: Brent Martini, third from right, visits Fordham every five to six weeks to meet with students working on projects in the Social Innovation Collaboratory.